Away up in Gorgie at Tynecastle Park, as the old song goes, an eight-year-old boy passes through the turnstiles in the main stand and, once on the other side, regains his father’s hand. In his maroon and white scarf he is excited but also nervous – he has never been in a gathering of folk this big before. A Jam Tarts legend pranced in front of that famous old stand and, down at ground level in 1953, a future hero was studious in making mental notes about elite-class centre-forward play. This won’t happen anymore; the stand is coming down after tomorrow’s match. Hearts have to hope that the magic of Bauld, to say nothing of the magic of Ford, doesn’t vanish into the dust as the wrecking ball does its worst. Ford loved those excursions to Tynecastle every second Saturday from his home in Linlithgow where his father Alec was a vet. Donald Campbell Clark Ford, now 72, is a good man to speak about the stand although not in an obviously nostalgic way. “You entered the ground under it and were greeted by the doorman,” he explains. “Then it was left down the corridor, manager’s office on your right, past the boardroom to the little tea-room.” Ford’s world, beneath seats commandeered by camel-hair-coated Edinburgh businessmen with their season tickets, was a quaint and snug one. Of course, he says, there’s sadness about bidding farewell to the stand because it’s stuffed with memories, but the structure needs replacing. Life goes on, as it does for Ford. He’s not an obviously nostalgic man but a restless soul, looking forward rather than back. His wife Carol is always telling him to slow down. “She’ll say: ‘Donald, why do you have to win all the time?’ It’s not that, it’s just I’ve always wanted to be the best I can be. The best centre-forward I could be, and I had to work at that because I wasn’t blessed with lots of innate skill. The best cricketer. The best accountant. The best photographer.” The day after our chat he is up at 3am for what he hopes will be a dream picture, looking from the beach in the north of Gigha towards Jura. If the shot works it’ll go into a 2019 calendar. He produces two every year, one landscapes, one golf. Ford was a Gorgie polymath, doing most of these other things while amassing 188 goals – he was Tynie’s renaissance man. He also strove to do a good job as a councillor, representing his home town on an Independent ticket, but still regrets not being able to halt the “award-winning rectangular garbage” constructed next to Linlithgow Cross or keep the M8 from encroaching too near the loch. 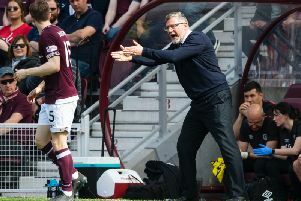 sport in the summer with Hearts’ blessing – “I always came back for pre-season training nice and sharp” – and after he was finished with football. He turned out for Scotland in the 1980 Benson & Hedges Cup but caps weren’t awarded. “That was disappointing but I was thrilled to be at Lord’s to see my big brother Malcolm hit 66 against the MCC.” A fine left-handed batsman, Malcolm sadly succumbed to alcoholism at the age of 50. Ford’s father also represented his country with the bat and at one time the lad contemplated following him into veterinary work. “Dad had a country practice and he’d knock on my bedroom door if there was time to go with him to a calving before school.” But, thanks to an inspirational maths teacher at Linlithgow High, John Ferguson, Ford also loved sums. He opted for accountancy and then Hearts spotted his talent. Ford is fondly remembered for his energy, unperturbable Action Man haircut and sportsmanship. He was only ever booked once, and even then supporters of a certain age still reckon the caution for appearing to throw the ball at a referee was grossly unjust. “King Donald was returning it to the official in a gentlemanly manner,” protested one during feverish fansite debate a few years ago. Of course it was the accurate toss of a cricketer, added another, although “not bodyline”. A third commented: “I’m sure a freak gust of wind caught it because it gathered a devilish pace.” The man himself in his clear-eyed way insists his era was nothing special, especially after what had gone before. “The year I joined was when Hearts started to go downhill,” he says. But in listing the disappointments of his era, Ford is being too hard on himself. Those who witnessed it remember his goals and were grateful for them. He headed the winner at Ibrox, Tommy Murray gallusly sitting on the ball in the build-up. He netted four at Broomfield and a hat-trick of penalties at Cappielow. At Fir Park there was a fuel-injected rocket, in the Texaco aptly, and he hit the opener in a 6-5 Scottish Cup tie victory at Tannadice. Of his strikes in front of the Tynecastle stand there was the fantastic curio of an experimental friendly – no offside for an international gathering of blazers and boffins – in a rematch with Kilmarnock a few weeks after that league showdown. The faithful hailed a new hero, Ford scoring five of Hearts’ eight. “And only one of them was actually offside,” he says with an accountant’s precision. He is particularly fond of his contribution to the four the Jam Tarts banged past Hibs in the next derby after seven-nil. Ford credits Drew Busby, Bobby Prentice and Kenny Aird in a briefly-dazzling Gorgie side with helping him force his way into the Scotland squad for the 1974 World Cup. Before that match tampering with the rules, top legislator Sir Stanley Rous said: “Association football is a simple game played by simple people.” True, but Donald Ford would be entitled to take exception.